Not so long ago, I got this weird letter in the mail from the great State of Tennessee’s Board of Architectural and Engineering Examiners asking me to take down all of the references to architecture on my website since I’m not an architect. It’s not that I had forgotten that I’m not an architect—did I mention that I’m not an architect?—it was just an honest mistake, some crossed wires between my copywriter, web designer, life and myself. (We quickly removed all references.) And these crossed wires became live wires when someone felt like giving me a hard time about semantics. It’s illegal to call yourself an architect or to call your work architecture if you don’t have an architectural license. What I am is a residential designer. What I do involves creating habitats for shelter with gorgeous interiors, exteriors and landscaping. It is, in effect, architecture, interior design and landscape design. But I’m not an architect. I have a degree in interior design. And, by the way, I’m not a landscape architect either, just in case the State Board is concerned. What’s the difference? A degree, years of training, and the fact that I can’t stamp drawings or create commercial buildings or design homes that are over 5,000 square feet. I was mostly trained outside of a classroom, and though I once intended to seek an architectural degree, I just never got around to it. Now life and work are booming, and I don’t see the need—even though all signs have pointed toward design and architecture my whole life. 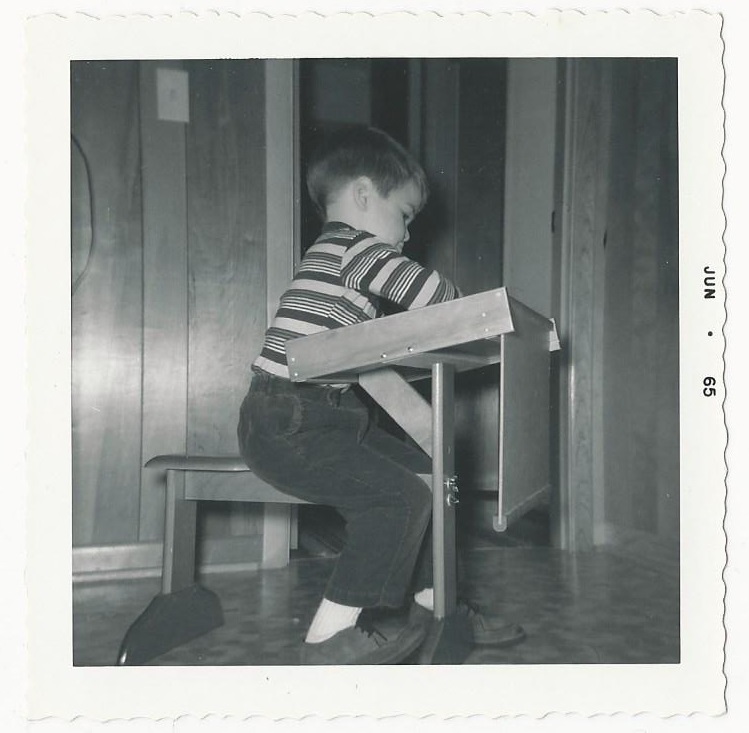 See: This is me at my drawing board in 1965. I call it “Dee the Draftsman.” I was five years old in this photo my mother thankfully saved for me. And in ninth grade, when I was assigned a term paper about a career path, I wrote mine about architecture. And I still have it. The writing was on the walls, almost literally, in spite of the fact that I grew up in a ranch house in the suburbs of Nashville that had a dividing wall down the middle with rooms on each side and a stairwell at the end. You know the type. I always loved “The Brady Bunch” and “The Munsters,” mostly because I was fascinated with the houses, and I was very into redecorating or rearranging my room—and often. Even on vacation, we would check into a hotel, and I would move all the furniture that wasn’t bolted to the wall. It’s a sickness. I was weird, and I just always knew what I was supposed to do. During high school, my mother was gone from home one day, and I took the opportunity to resolve something about our ranch house that had long bothered me: The stairwell on the end of the house had a window in it, and it was next to the living room. I always wondered why that window existed. It didn’t do anything but provide daylight in the stairwell. So, having helped my father build out our basement years prior, I got out his Skillsaw and cut this big rectangular hole in the wall. I didn’t do it right; I didn’t put a header in or anything—I just cut the studs in half, cut the drywall and made the biggest mess. I was so happy to realize it wasn’t load bearing. And when my mother arrived there was this big rectangular hole in the wall. Once she came to her senses we finished it, hung a stained glass on a chain in front of that window (next to a fern), painted it and it looked awesome. Everybody on the street was just mesmerized. Here we are in Podunk, and we had just cut a hole in our wall. It was the talk of the neighborhood. In 1978, I went to college at the University of Tennessee in Knoxville, discovered interior design, and it stole my heart. But architecture kept calling me still. Around 2000, I decided I really wanted to return to school to get my architecture degree. I had a long talk with Manuel Zeitlin, who I admire still to this day. He was and is a friend who happened to be a revered architect here in town. He suggested I go to Boston Architectural College, where he received his degree. He almost had me convinced, but then I was like, “Look, I am an adult, and I have a house and I have pets and I have bills and I can’t just fold up and go to school.” Then, that very Sunday in the newspaper there was an ad in the classifieds for an architect intern at this little firm here in town. They did really wacky stuff that I loved. I called them and said, “I’m not an architect, but I’m your guy. You’ve got to hire me.” (See, I’ve been saying “I’m not an architect” my whole life!) And they did. I only worked there for a year and a half when I realized I had to start my own design firm. The planets have been aligned for me to do this—whatever you want to call it—since 1965, but I didn’t completely pay attention until I was an adult, and by then maybe it felt too late to stop, drop and get my license. But that’s OK because I’m more than happy to be able to do the things I do today and to design the homes you see on my site and along the streets of Nashville. Just don’t call me an architect; I’m proud to say I’m a residential designer. Now that we’ve gotten that out of the way, let me design a fabulous house for you! This entry was posted in Uncategorized and tagged architect, architecture, landscape design, residential design, residential designer on May 11, 2015 by Ellen Barnes.